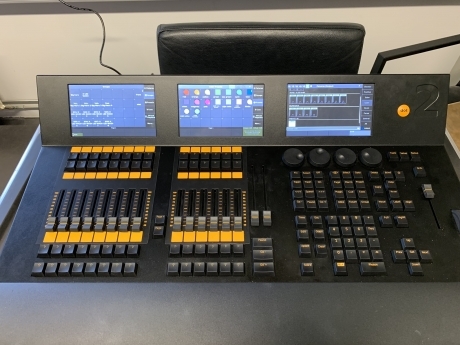 This MA Lighting dot2 XL-F Console is from 2018 and was used in theater. It shows signs of minor wear, but is in good working condition. Intuitive operation is the core of the dot2 philosophy and with a comprehensive set of connectivity hardware on all console models, the dot2 range is suitable for most theatre, touring, corporate, TV and education lighting environments. The dot2 XL-F is a dot2 core console with a dot2 F-wing built-in. Still with a small footprint it includes the full programming section, master playback section, 14 fader playbacks and 28 individual playback buttons. Three built in touch screens and support for one external touch screen ensure the dot2 XL-F has the flexible hardware required for almost any kind of show. The easy to operate dot2 software is available in multiple languages and provides onboard Help and Direct Hints to guide a new user to operate the console to its full potential. Simply Patch and Go, with no additional setup required. A full range of clever programming and playback features provide intuitive access to advanced functionality. Access to generic fixture functions is via a Smart Dialogue and Store Look functionality ensures you can control and record what’s intended. Automated tools; Track & Shield and Auto-Unblock simplify cue-list management and Auto-Fix allows playback page changes to occur without unexpected results. This item has been listed by a member of our worldwide community. Buying a brokered item like this is the perfect way to purchase hard to find equipment at a great price. All brokered item sales include a 48 hour quality inspection window. Once the item arrives, just let us know if you are unsatisfied- your purchase is guaranteed by UsedLighting.com! Size: 16.8" x 29" x 6.4"
A member from our team will reach out to the seller to determine the shipping cost and will contact you with the total cost for your approval. Payment will only be authorized, not processed, until the shipping cost is approved by you.